Tap, tour and try a pint at Cumberland Valley breweries and pubs! The Valley&apos;s emerging breweries and restaurants welcome locals and visitors to sample the unique flavors of craft brews. 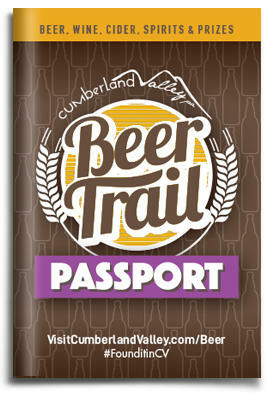 View a list of locations here or download the official Cumberland Valley Beer Trail Passport. Visit the locations inside of the passport and get a sticker for each location you visit on the back panel! Collect stickers, tear off the back panel, fill out your info and mail it or email it to us to win prizes. View more details in the passport. You can pick up passports at participating beer trail locations and the Cumberland Valley Visitors Center.